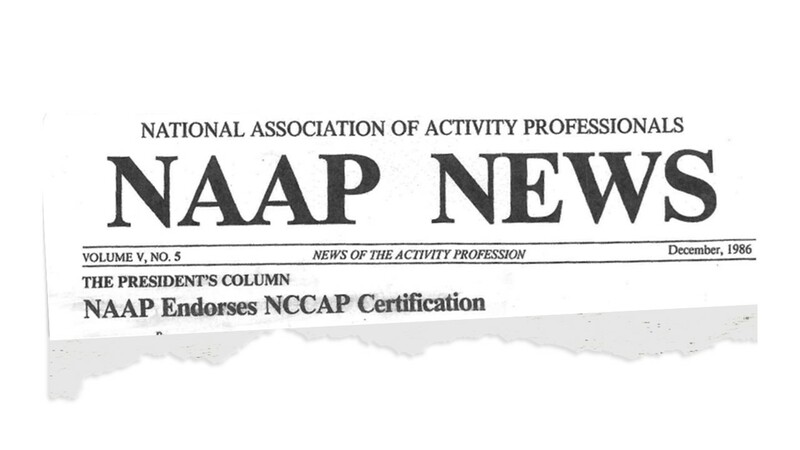 In response to the requirements of the Omnibus Budget Reconciliation Act (OBRA) of 1987, the National Association of Activity Professionals (NAAP) established the National Certification Council for Activity Professionals (NCCAP) to offer the highest level credential of qualification as a Certified Activity Professional. NAAP and NCCAP work jointly for the shared mission of advancing the Activity Profession. Read about the creation of NCCAP in 1986. Established in 1986, NCCAP has been the leading credential for person-centered care that ensures the highest quality of life for the aging population. NCCAP standards of care advance the physical, cognitive and psycho-social well-being of older adults. To date, we have trained and certified over 150,000 individuals. Recognized by the Centers for Medicare and Medicaid Services (CMS), NCCAP sets the highest standards using the social model of care for the education, training and certification of those providing care. Our certifications are designed to meet Federal Regulations and Behavioral Health Tags applicable to activities and engagement in long-term care settings. A nationally-recognized, trusted nonprofit credentialing body, NCCAP works with care partners across all settings. Whether traditional long-term care, assisted living communities, adult day centers or care provided to someone aging in place at home, NCCAP certification advances the quality of life and continuity of care for those we serve.